Xenon Filled Sextuple-Glazed Units with Low-e on all Lites or Solera? As various proposed and adopted building codes, such as LEED, ASHRAE 90.1 and IGBC, call for lower energy consumption of buildings, architects and engineers are confronted with numerous high performance building envelope materials. Fenestration has traditionally served as the weak link in the building envelope driving reduction of window to wall ratio. When glass is considered as a primary building envelope material (in excess of 50% of the building envelope) the challenge becomes finding techniques and technologies in glass that are advanced in thermal efficiency and also in finding a balance between daylighting, energy performance and aesthetics. U Value/R Value – The measurement of heat transfer through a given building material. Solar Heat Gain Coefficient (SHGC) – The amount of solar heat that passes through a window. Shading Coefficient (SC) – A fraction of solar radiation admitted through a window, door, or skylight – transmitted directly and/or absorbed, and subsequently released as heat inside a building. Visual Light Transmittance (VLT) – A measure of the amount of visible light that passes through the glazing material of a window. All these parameters affect the overall building envelope efficiency which is the cornerstone to an energy optimized building. 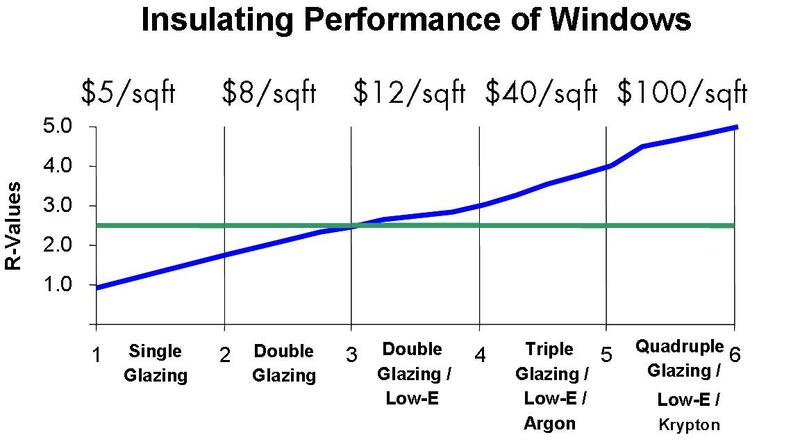 Standard glazing materials such as “high performance” low-e fall short of adequate insulation (U Value 0.285 Btu/hr. ft2°F) compared to walls with U value 0.06 – U value 0.05. 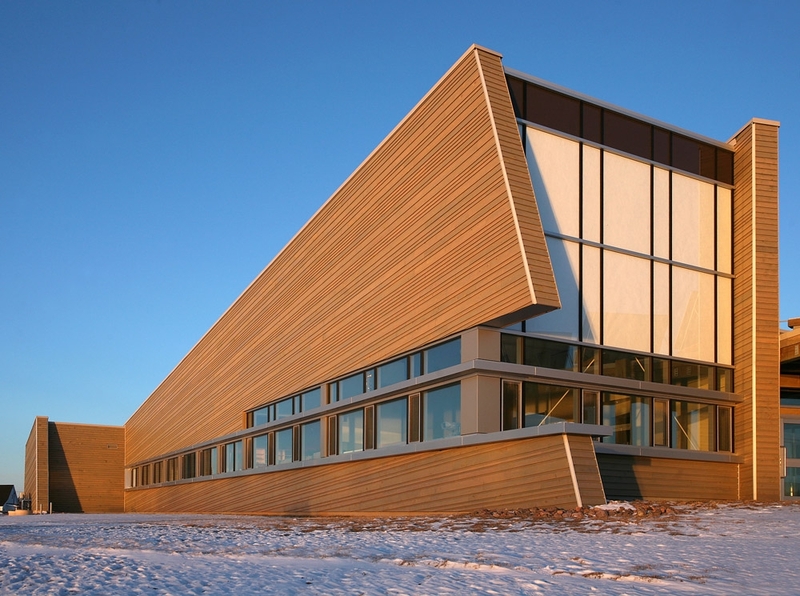 Architects and Engineers are challenged to find higher thermal options in glazings. Unfortunately, the options are neither cheap nor easy to use. Let’s take a brief look at the most common options to improve your thermal glazing envelope such as triple glazing and the use of various inert gasses such as argon. Triple Glazed Units 0.31 Units with three layers of glass. Argon 0.45 Insulated glazing unit filled with argon. Krypton 0.44 Insulated glazing unit filled with krypton. Very marginal improvement in u value – high price differential. Xenon 0.43 Insulated glazing unit filled with xenon. Heat Mirror 0.18 A low-emissive coated film product suspended inside a triple insulated glass unit with two airspaces. (Vacuum glazing with low-e) Two soda-lime glass sheets separated by a narrow evacuated space. Thickness of less than one centimeter. Spacers impair transparency. Expensive to make the glazing-edge seals. Very high cost. Product not available today. Gasses such as krypton, argon or xenon are used to fill the space between glass panes to minimize convection within the space. This reduces overall transfer of heat between the inside and outside of the unit and reduces condensation buildup. However, the argon/krypton/xenon molecules are smaller than the molecules of surrounding material resulting in a 1% loss of inert gas per year as claimed by manufacturers. In reality, this loss has been shown to be higher. Since you cannot see or smell the gas you never know if it is still there or how much is there. Once gas is displaced, the R value can be lower than if it was not there in the first place. Air does not rush in to fill the void leading to seal failure or, even worse, implosion. When looking at a building life cycle being 70 – 80 years, gas filled units do not present a good value proposition with a loss of 70-80% of the original thermal performance. Weight poses an issue with triple and quadruple glazings due to the increased cost of installation, labor and equipment. The “50% plus” increase in weight also creates a greater load on the curtain wall and puts limits on frame usage and size. Additionally, the weight can cause balances to fail before their time causing sagging in some casement windows. Triple and quadruple glazed casements are restricted in size due to stress caused by additional weight. The Solera line of products delivers a balance between performance, design flexibility and affordability. Engineered to deliver superior daylighting and a range of thermal insulation, Solera translucent glazing units exceed prescribed U-value for fenestration in building codes. In many cases, Solera+Nanogel Insulation (U value of 0.05 / ~R20) exceeds the thermal value required for walls. A new product will be introduced in the near future providing a U value of 0.10 / ~R10 . All Solera products are designed to fit into standard curtain wall, storefront, window and skylight systems and are highly configurable enabling architectural control without leaking gases and burdensome triple and quadruple glazings. Affordable – Advanced Glazings has managed to make the relationship between cost and thermal performance linear unlike the historical relationship seen in the graph above. Counter-intuitively, the R20 Solera+Nanogel Insulation unit is more affordable and has superior performance compared to the unstable alternative of a quadruple glazed unit with krypton. Durable – Solera lasts the life of the building and is warranteed for both performance and aesthetic consistency. Therefore unlike other translucent materials, it will never yellow. Light Weight – Solera+Nanogel Insulation is a third to a half of the weight of a triple or quadruple glazing while providing superior performance. Solera’s other primary function is to diffuse full spectrum natural light in a space. The outcome is space filled with natural light without the harmful effects of solar heat gain and glare. A good daylighting strategy delivers higher quality of life for occupants and reduced energy bills. Solera brings new opportunities for architecture. It’s a stable material, which redefines how we use glass on buildings exceeding even the most stringent green building codes in an affordable, aesthetically pleasing and functional manner. Defining the balance between views and daylighting is at the heart of understanding how to best design with Solera. The architect should determine the overall thermal goals of the building and balance that with where views are critical. In those locations, use the highest performing clear glass option available to you. Around that, design with a wide angle diffuser such as Solera even in lieu of standard walls. It is critical to remember that as a light diffusing translucent, the daylighting must be studied. Advanced Glazings provides complimentary daylighting analysis on all our projects and works hand in hand with your engineering team to ensure you have the most efficient configuration for your building envelope. Solera can help designers achieve many points towards the performance-based method of the International Green Building code including interior light reduction, life cycle, and total annual net energy use. Solera also contributes towards LEED and ASHRAE 90.1. There is a saying that you cannot reinvent architecture every day of the week, but its Monday and we are reinventing architectural opportunities. Solera is redefining building envelope materials with long lasting thermal insulation providing unmatched R values. I find that the solera product with nanogel may be the next evolutionary step in designing responsibly with glass. architects love the look of glass curtainwalls, and clients love the aesthetic they provide-especially in residential construction where views sell. new energy codes require better and better performing envelopes, and many glass systems cannot hope to meet the requirements without going to more and more expensive coatings and even adding triple glazing or exterior blinds which can be maintainence headaches. this is a simple all in one solution for improving the envelopes performances while bringing more lightin deeper into the space and also protecting against glarea. i would use this product at spandreal and clerestory conditions to maximize the amount of natural light without sacrificing performance. News from Advanced Glazings Ltd.